The Laserscope Lyra system is a surgical laser system that can be used for a variety of cosmetic procedures including leg and facial veins, laser hair removal and wrinkle reduction. 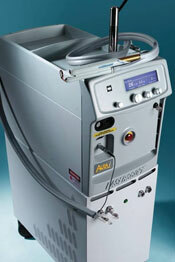 This model features a 1064 nm Nd:YAG laser. The Laserscope Lyra system is also available as the Laserscope Lyra i and Laserscope Lyra XP. The Laserscope Lyra system is unique in that it was the first laser machine of its kind that can be used on virtually all skin types and tones. It offers a variety of spot sizes and pulse durations so that you can treat patients comfortably and efficiently. To get the lowest price on a pre-owned Laserscope Lyra laser machine, fill out the contact form at the bottom of this page for a no obligation quote. In addition to being extraordinarily versatile, the Laserscope Gemini laser machine is very easy to operate thanks to an intuitive touch-screen interface. It also offers the largest KTP green spot size ever developed, so that you can treat patients faster than ever. To get the best price on a used Laserscope Gemini system, contact SunrayLaser.com today. At SunrayLaser.com, we can help you save thousands of dollars on a pre-owned Laserscope Gemini laser system, and we guarantee that you will be satisfied with the quality of our ultrasound equipment. Just fill out the contact form below for a Laserscope Gemini price quote with no obligation at all.